A Birthday Party for Connie, the King Cobra! Get your face painted to look like a king cobra for $9.75. Visit the face painting booths located near the Humboldt Penguin Exhibit or near the Lakeview Place Restaurant. Watch the keepers feed Connie at 11 a.m. and 3 p.m.
Watch Connie participate in an enrichment activity as she interacts with a scented item at 1 p.m.
King cobras are the longest venomous snakes in the world with an average length of 10-12 feet. 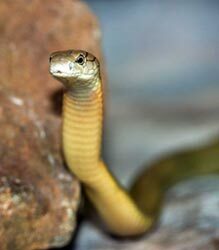 Although the king cobra prefers to avoid conflict, it can raise the front of its body approximately 3 feet high off the ground and pursue its enemy in this position for long distances. Native to northern India and Southeast Asia, the king cobra is considered a threatened species. King cobras are extremely intelligent and curious animals. Our keepers provide many forms of stimulating enrichment for the king cobra including the use of scents, temperature/light changes and props. Help Connie celebrate her birthday on Tuesday, August 5, in the Aquatic and Reptile Center. King cobras are the ONLY snakes known to build nests from leaves and protect their nests from predators.